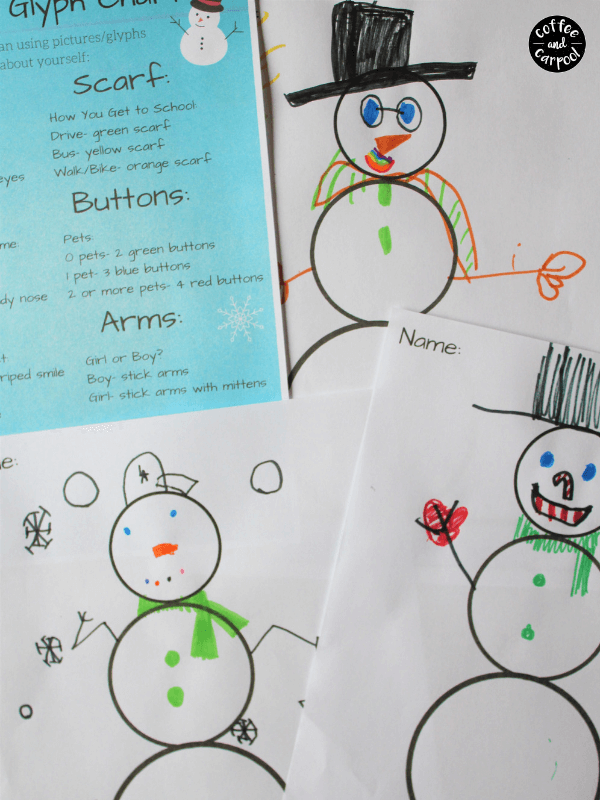 Inside: Need a simple yet fun snowman project, that is winter-themed to make with a group of children? 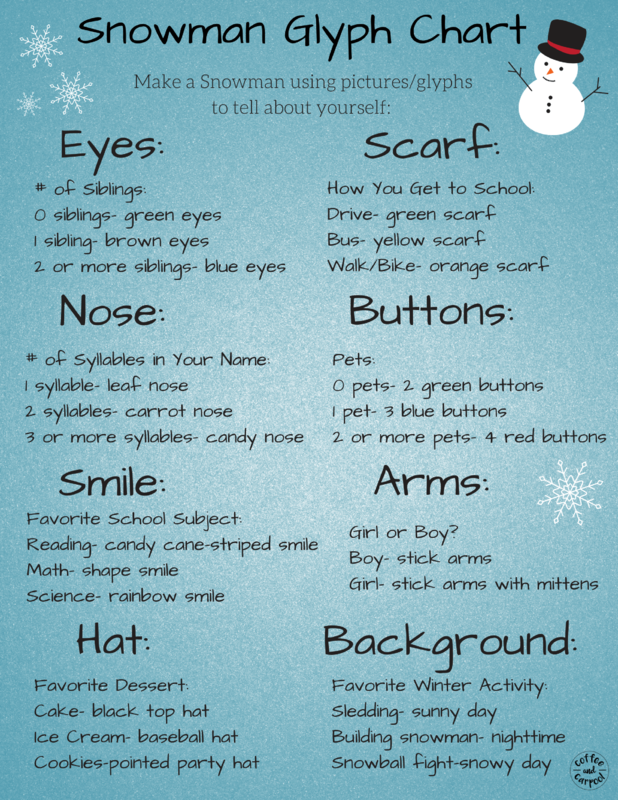 This is perfect for teachers, homeschoolers and room parents who need winter-themed ideas for classroom parties. I was tasked with creating a holiday party for my children’s entire school. 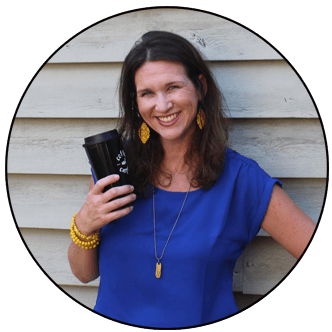 Instead of each room parent creating very different parties, our PTA throws the party. So one parent…me… has to design a winter themed party that’s suitable for the younger grades and another one for the older grades. Nothing too Christmasy was allowed because our student population is extremely diverse. Which is fantastic. So we needed winter, snowmen, and snowballs. I needed something fun, unique, low cost, low prep, and low mess. I couldn’t find what I was looking for, so I created it. 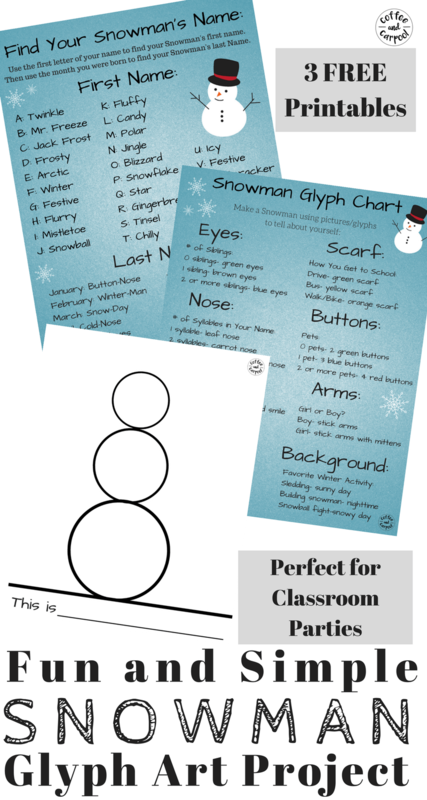 This Snowman glyph craft is perfect for homeschoolers, teachers, and room parents who need a winter-themed class activity. A glyph is made out of smaller pictures that tell a story, similar to hieroglyphics. It is a following directions activity that is simple enough for a Kindergartener, but fun enough for fifth graders. 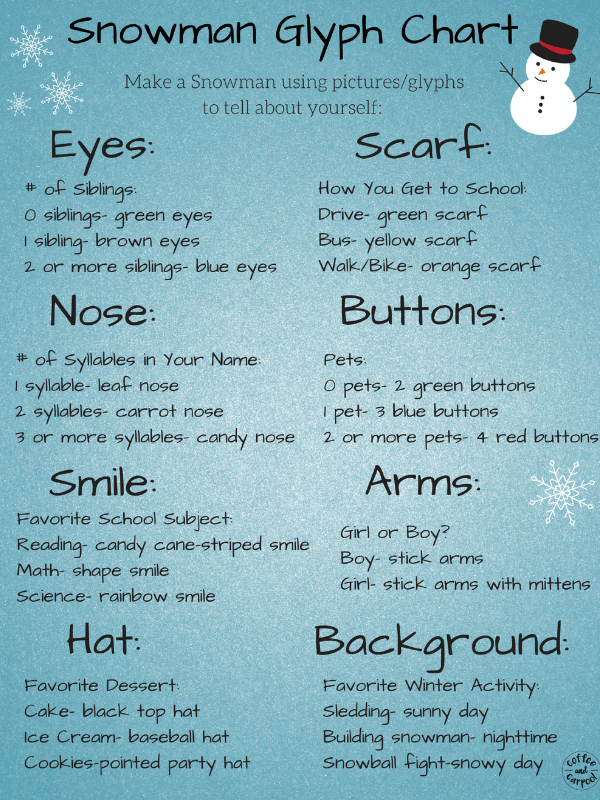 And there is no right or wrong way to create this snowman craft because kids are answering about themselves. The kids already know all the answers to this because it’s all about them! 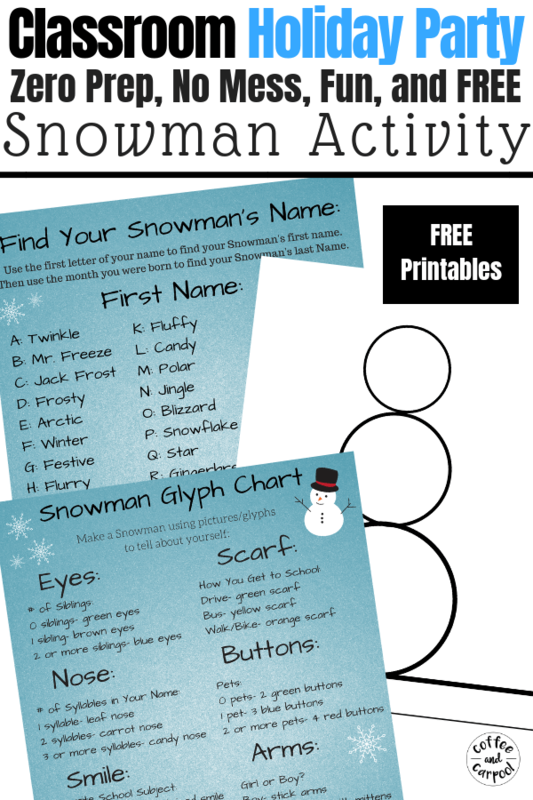 Print out this blank snowman template and print it on paper or cardstock. You need one for each student. Print out these glyph chart instructions. 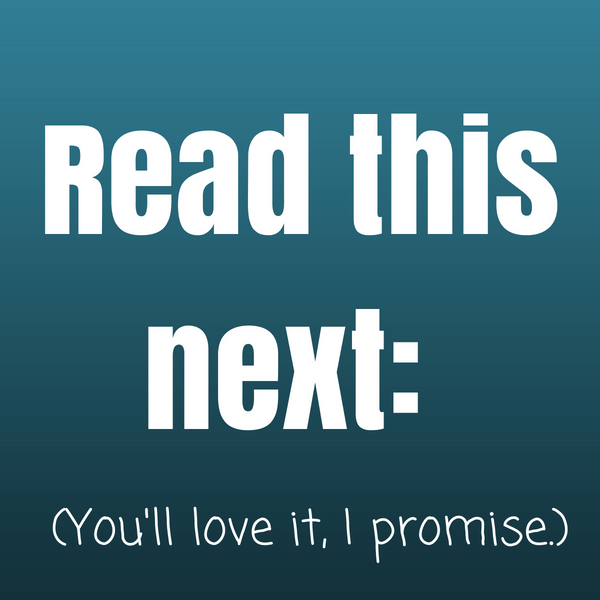 You only need one you read off, or you can print out one for each student/ group if they’re older and can read independently. 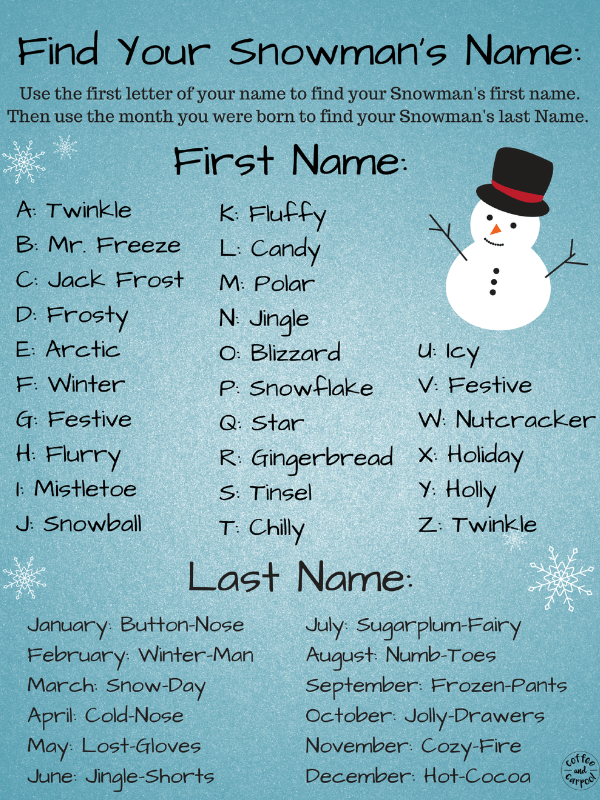 As an added bonus, print out this fun Name Your Snowman Chart. 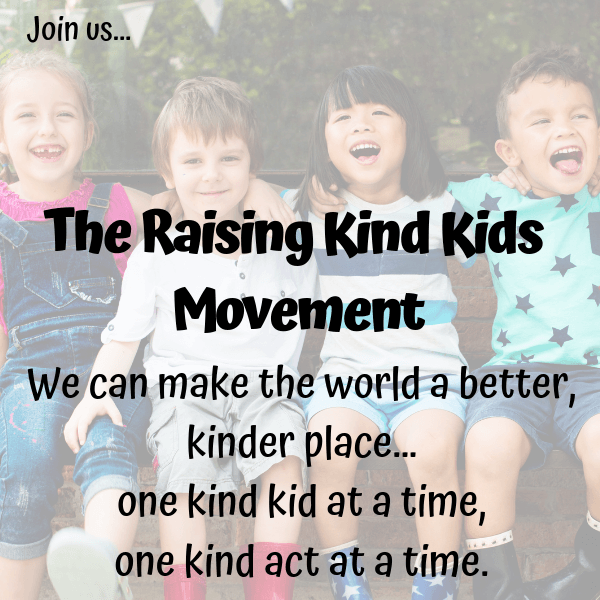 Get all three free printables here! 1. 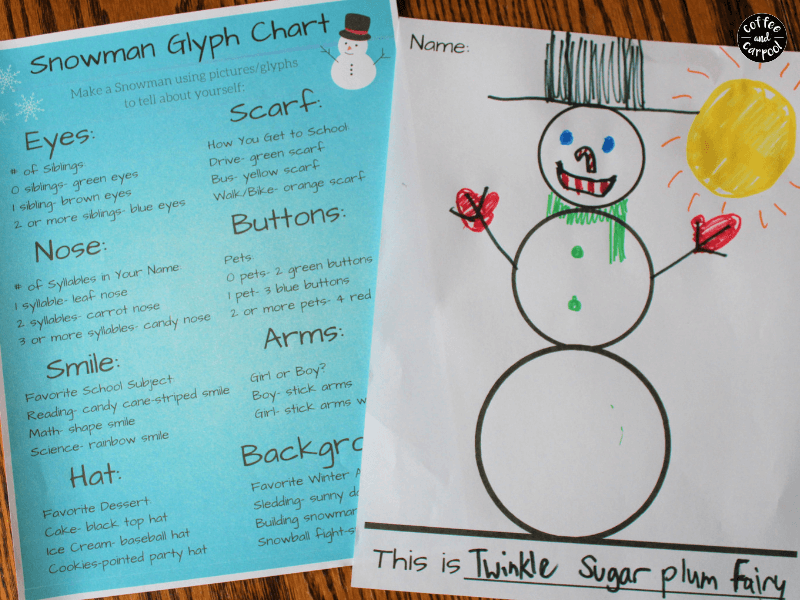 After each child has their snowman with their name on it at the top, explain how a glyph works. You will read off the first part, and instead of answering out loud, they will show their answer by the way they draw on the snowman. 2. 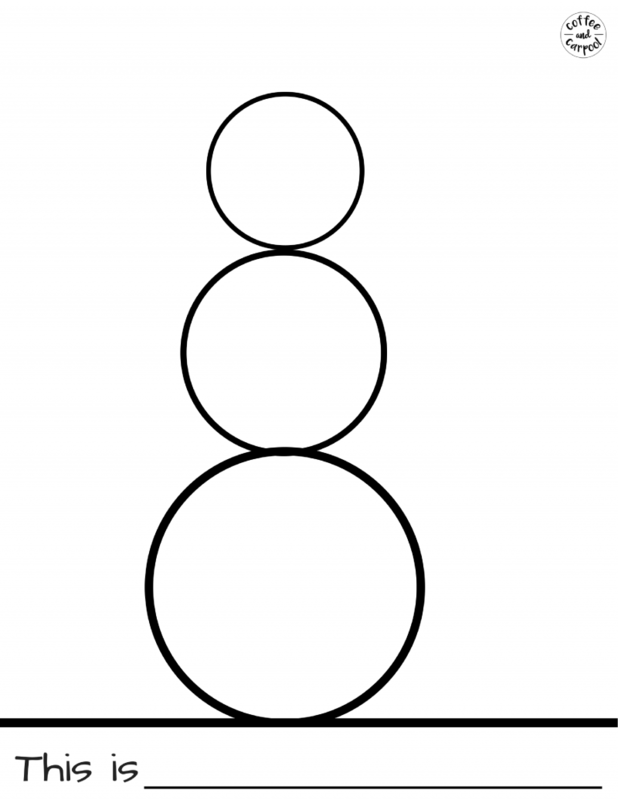 Read the first glyph for the snowman’s eyes. If they have no siblings, their snowman will have green eyes. If they have 1 sibling, their snowman will have brown eyes. If they have 2 or more siblings, their snowman will have blue eyes. 3. 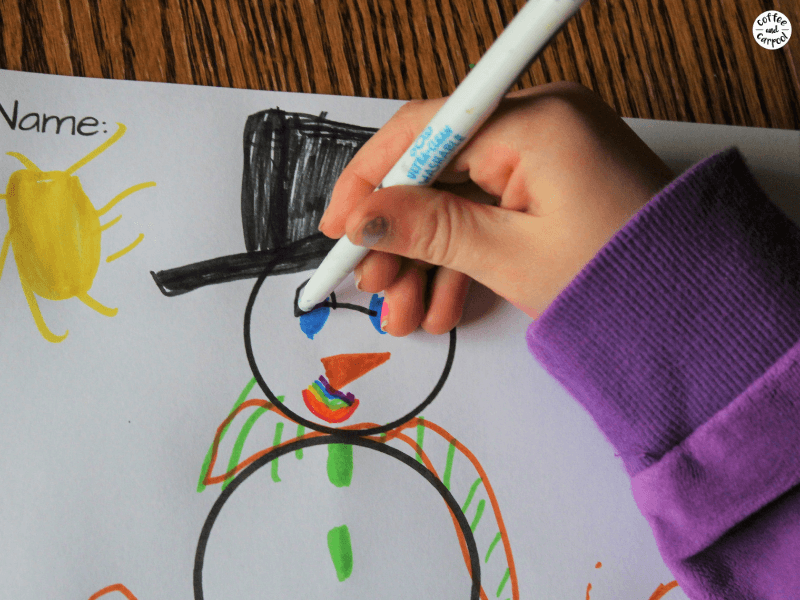 Continue through each of the snowman’s body parts until they finish with the background. 4. 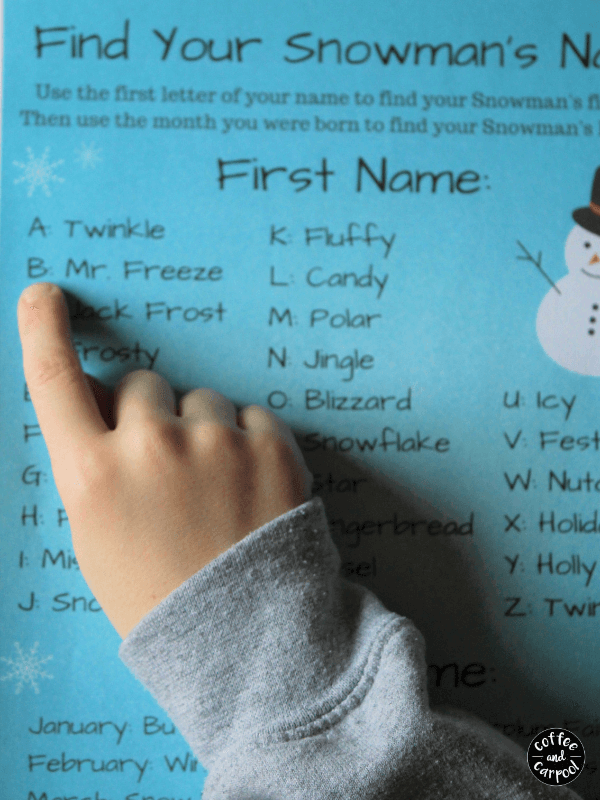 With help, the kids can determine the name of their snowman using their own first names and the month they were born. 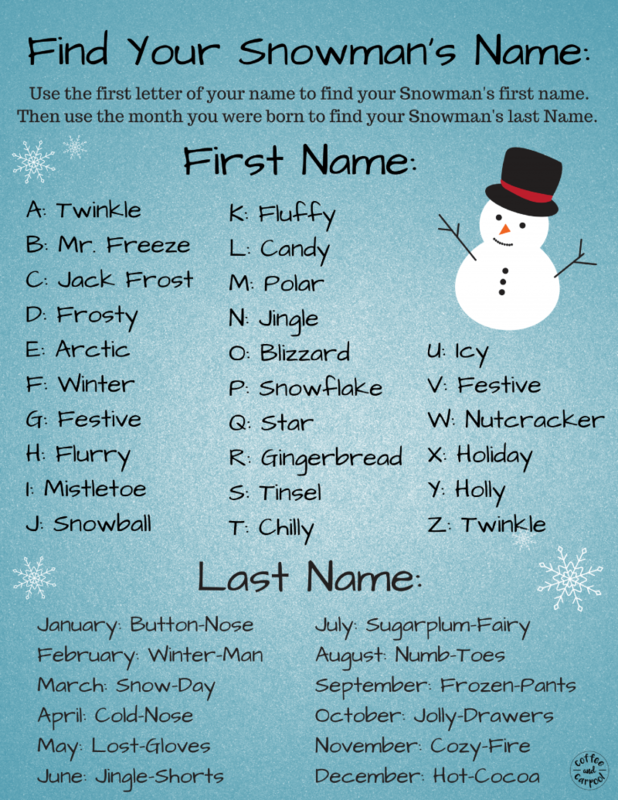 They can then write their snowman’s name on the line provided or an adult can write it for them. The best part about these glyph snowmen is that no two will ever be the same. And you get to learn a little more about each child as they complete their art project. Love this craft? Pin it! Or follow me on Pinterest for more ideas! 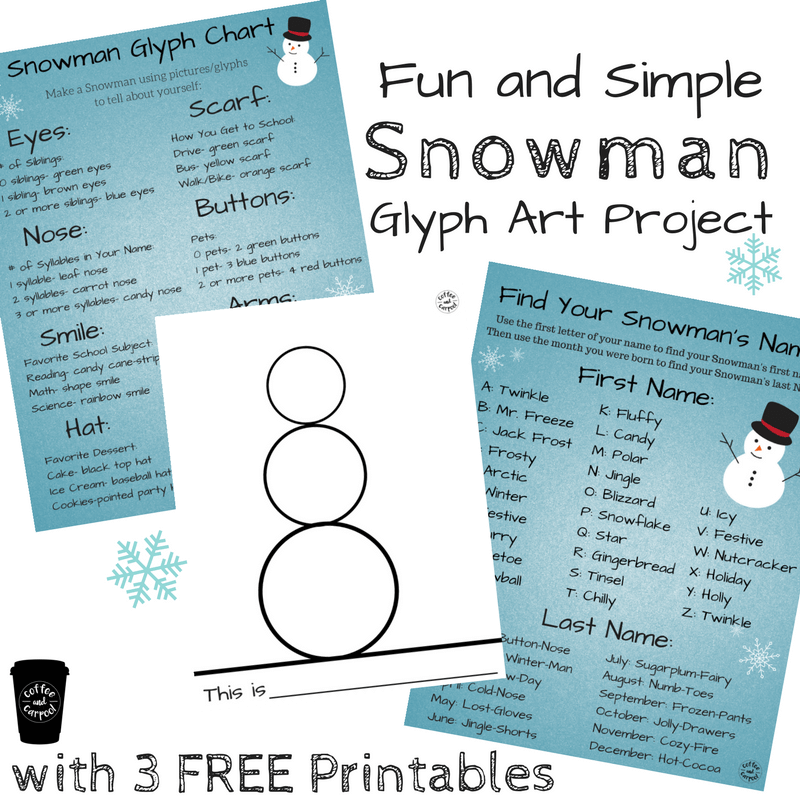 Want another Snowman Project? 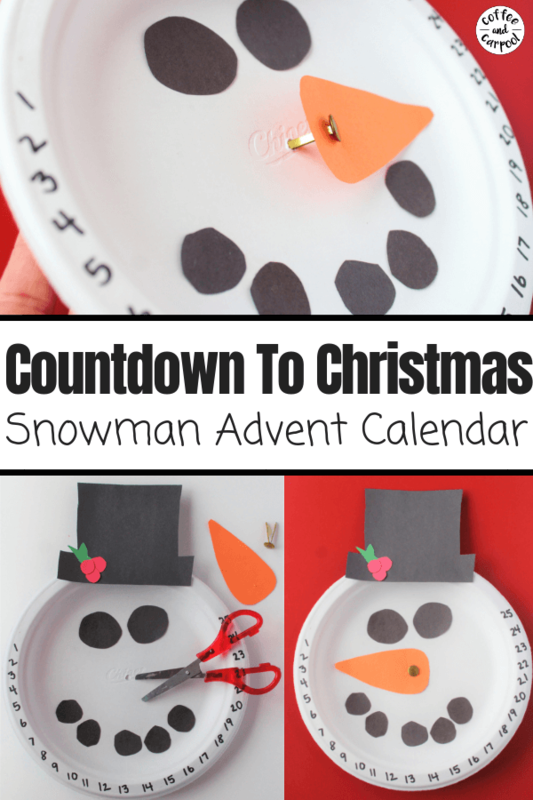 This Countdown to Christmas Calendar is adorable! This is great! What a unique idea and I can imagine how much fun the kids had. Thanks for sharing. 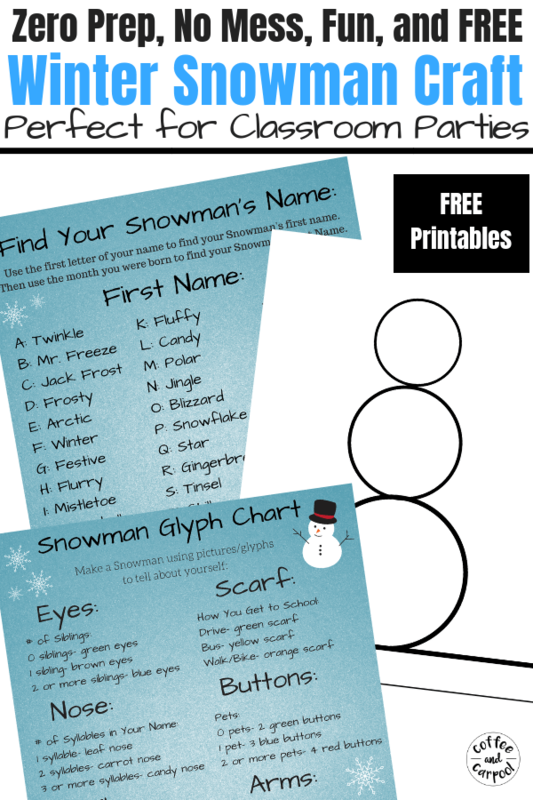 I shared on my Free Printables group board on Pinterest and on my sub-reddit Free Printables. So cute! I love that Snowman Glyph. I shared it with all my teacher friends.